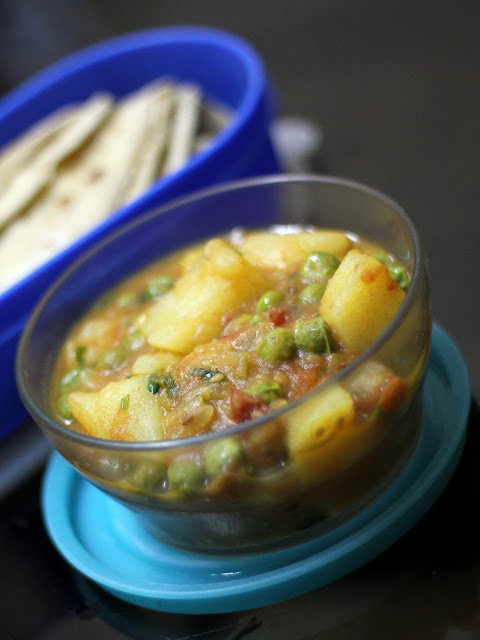 Aloo and Mutter - a combination universally loved by all; and it finds expression in a unique manner in every cuisine. I remember an advertisement that said " Aloo Mutter, aur bahut saari mutter. Aur garam, garam Pooriyan!" I love to make this gravy. Simple and tasty. Today it found it's way into my son's lunch box, along with Chapathis. Peel and cut potatoes into largish (about 1.25") cubes. Microwave the potatoes and peas until half cooked. Sprinkle salt and water over the vegetables as soon as it comes out of the microwave. Heat oil and splutter jeera seeds. Add onions and saute until it changes colour. Add tomatoes, turmeric powder, chilli and ginger. Stir cook over a low flame until pulpy. Add peas and potatoes along with masala powders and salt. Stir fry for 3 minutes. Add 1.5 cups water and bring to a boil. Simmer until flavours are absorbed. Mash a couple of potatoes to thicken the gravy. Serve garnished with chopped coriander. Potato sandwich - video recipe!